Editor’s Note: This is the first of two issues of the Crystal Ball this week. We will also have an issue Thursday, July 19. Only about half of American adults believe elections are fair and open, and large majorities of Americans express skepticism about big money in politics and favor disclosure of donations. However, as the Senate considers President Trump’s nomination of Brett Kavanaugh to the Supreme Court, the public offers mixed signals about judicial intervention that could either tighten or loosen the law concerning money in politics. These are some of the takeaways from a national poll conducted by Ipsos in conjunction with the University of Virginia Center for Politics. By a 51%-43% margin, those surveyed agreed with the statement that “American elections are fair and open.” However, there was a partisan gap, as 68% of Republicans but just 43% of Democrats agreed with the statement. Couched opinions — those who just “somewhat” agreed or disagreed with the statement — were more common than strong opinions from Democrats, Republicans, and Independents. 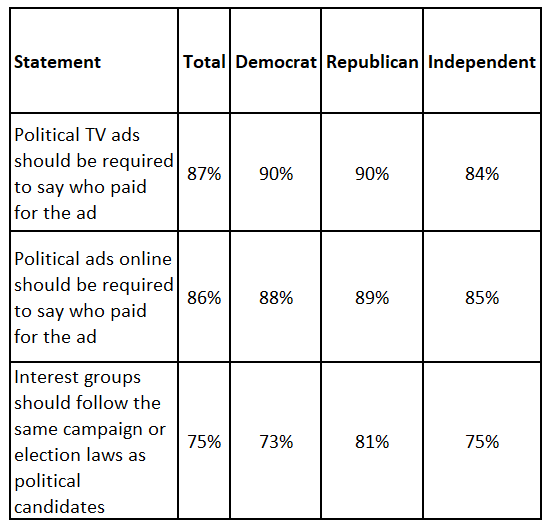 Americans largely agreed with several other statements dealing with mandated disclosures of who paid for televised or online political advertisements and whether interest groups should follow the same campaign/election laws as candidates. Unlike with the fair elections questions, there was little difference among partisans on support for these statements, which are shown in Table 2. Respondents also expressed concern about a recent large, anonymous, and legal donation made to an outside political group (this question relates to this story). 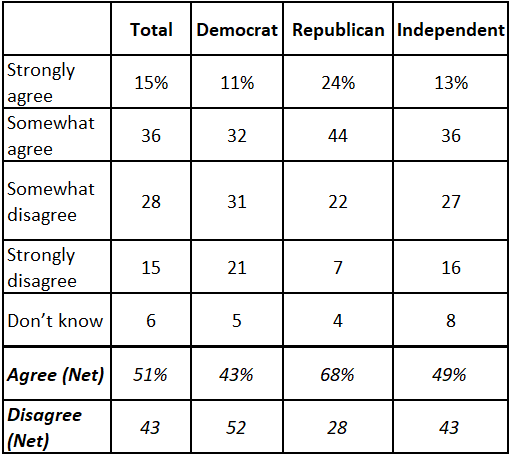 When asked which of two statements was closer to their views, nearly three-quarters of respondents agreed more with a statement that the donation is an “invitation to corruption,” while a little over a quarter of respondents agreed more with an alternative statement that “People should have a right to give as much as they please, and do so anonymously.” Democrats (78%) and Independents (76%) were likelier than Republicans (62%) to agree with the first statement expressing concern about the large donation. Finally, respondents were asked whether the Supreme Court should intervene to either tighten or loosen campaign finance laws. Democrats were generally a little more supportive of the first three suggested Supreme Court actions — proposed restrictions, as described in Table 4 — than Republicans. 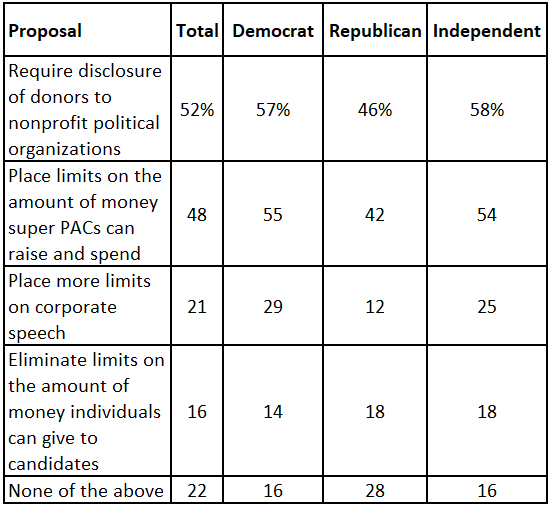 The fourth item, asking if the Supreme Court should eliminate donation limits and thus loosen campaign finance laws, attracted little support across the political spectrum. These findings come from an Ipsos poll conducted on July 5-6, 2018. For the survey, a sample of roughly 1,006 adults age 18+ from the continental U.S., Alaska, and Hawaii were interviewed online in English. The full results, methodology, and crosstabs are available here. This poll represents the latest collaboration between the University of Virginia Center for Politics and Ipsos, an international, independent marketing research firm over the last year and a half. The Center for Politics and Ipsos released two polls on Americans’ attitudes toward recent presidents, and the Center and Ipsos, along with Reuters, released a poll on Americans’ racial attitudes in the wake of a neo-Nazi march in Charlottesville last year.